Join a financial group that’s as committed to your future as you are. 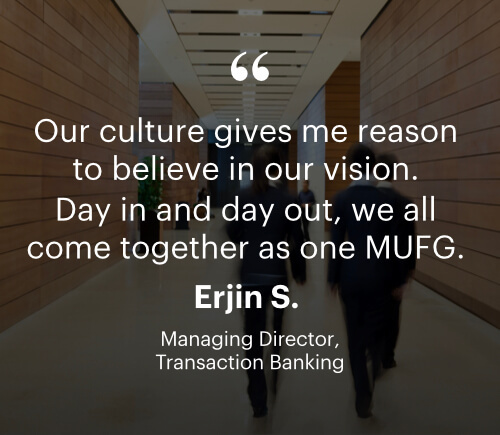 At MUFG, we share a vision for our future, we share our successes, and we strive to bring out the best in each other in everything we do. As the 5th largest bank in the world, our diverse team is connected by a common ambition to create change for the better—from forging more dynamic career paths to driving progress in our communities, to continuously reshaping the standards of global financial services. Positive impact starts here; see the change you can make as we strive to become the world’s most trusted financial group. MUFG is one of the world’s leading financial groups. 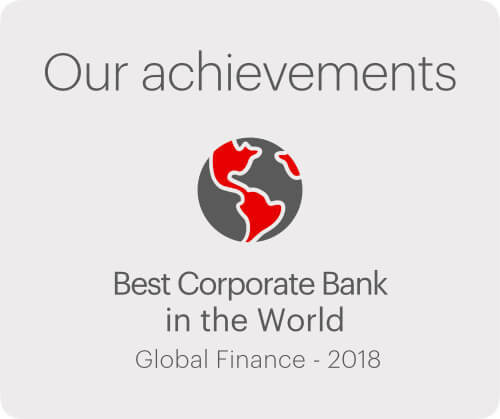 With over 350 years of growing the financial health of the world’s greatest businesses, Mitsubishi UFJ Financial Group (MUFG) has a global network of 150,000 employees, with 2,300 offices and 300 entities in more than 50 countries. Our promise is simple. We serve our communities, foster economic growth and aim to become the preferred trusted financial advisers to our customers. Together, we have the unmatched expertise and global capabilities to meet the diversified needs of all our customers in the Americas and worldwide. Advance leading risk management practices from within the MUFG, Credit Strategies Group (CSG)/Portfolio Analytics Team. Assist the design and development of credit models and end-user analytic tools. Present credit portfolio analytics results to senior management via specialty reports and in-person meetings. Perform this work in collaboration with other bank teams. Expand CSG’s Credit Risk Economic Capital (EC) modeling capabilities, supporting: (i) Risk appetite setting, (ii) Managerial stress testing, (iii) Concentration management, (iv) Risk-return analysis, and (v) Business strategic planning. Assist CSG projects by performing (i) Correlation and Concentration analysis, (ii) Hedge performance analysis, (iii) Asset allocation, and (iv) Other portfolio management analysis. Lead workshops, meetings and other forums to coordinate and inform key bank stakeholders. Develop solutions to analytical, implementation, and/or execution problems. Develop and maintain periodic risk reports/presentations on the following: (i) Key risk levels, (ii) Trends, (iii) Strategies, and (iv) Potential issues. Develop and maintain risk management documentation supporting (i) Regulatory and Compliance requirements, (ii) Stress testing models, and (iii) General policies and procedures. Assist in maintaining production risk management infrastructure, including: (i) Analytic models, and (ii) Data inventories. Develop and manage project plans in order to meet target goals and objectives. Coordinate activities in association with multiple bank divisions including: (i) Risk Management, (ii) Finance, (iii) Treasury, and (iv) Line of business Risk Owners. Notice: The above information on this job description has been described to indicate the general nature and level of work performed by incumbents. Other duties and responsibilities not specifically described may be assigned from time to time, consistent with knowledge, skills, and abilities of the incumbent. Bachelors degree required (prefer Masters or PhD) in Finance, Statistics, Engineering, Mathematics or other quantitative field (or foreign equivalent degree). 2-3 years of Risk Management experience. Superior quantitative capabilities and outstanding analytical skills, including an investigative mindset and ability to ask good qualitative questions. Project management knowledge coupled with the ability to work efficiently within a team. Strong oral communication skills. Should be able to describe technical topics to non-technical audiences. (Prefer good writing ability as well). Ability to understand risk data. Strong work accuracy and personal reliability. Experience with one or more of the following software(s) is preferred: R, Python, C++, SAS, MATLAB, Tableau. Solid understanding of MS Office Suite, SQL/Access, or other database software. Chartered in 1981 and assuming its current identity as MUFG Canada Branch, our Canadian Branch is the premier Asia-based global bank in its market. We serve local and Japanese clients from the Atlantic to the Pacific with financial expertise across a number of key industries such as oil and gas, pipelines, power generation, automotive, transportation, and telecom. The receipt of this application by MUFG Bank, Ltd., Canada Branch (“MUFG Canada Branch”), does not imply or guarantee employment. MUFG Canada Branch is an equal opportunity employer. 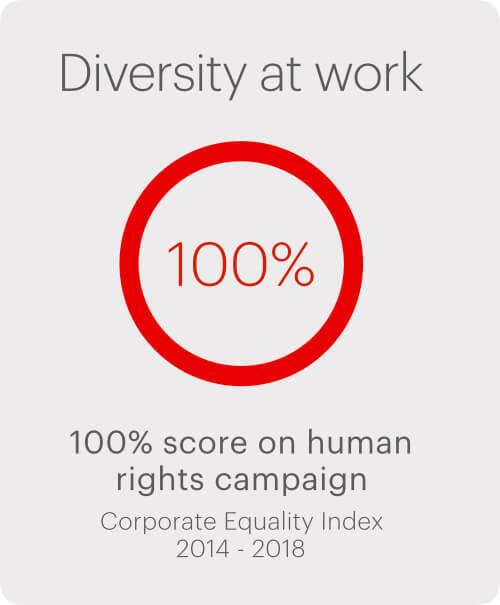 We do not discriminate in hiring or in any other aspect of employment on the basis of the grounds enumerated in the Canadian human rights act. In addition, MUFG Canada Branch complies with applicable laws prohibiting discrimination in employment in every jurisdiction in which it maintains facilities. MUFG Canada Branch provides accommodation to individuals in accordance with the requirements outlined in Canadian human rights act and the Canada Labour Code. Please note that you are leaving the MUFG Careers site. We appreciate your interest in a career with MUFG. It's people like you who bring commitment and inspiration to our workplace, and make us who we are as a company. We invite you to continue exploring the possibilities of employment with us in the future. We recommend you review their information collection policy, or terms and conditions to fully understand what that business collects. We are not responsible for the information collection practices of the other Web sites that you visit and urge you to review their privacy policies before you provide them with any personally identifiable information. If you wish to continue to the destination link, press Continue.